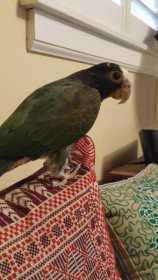 Male white-capped pionus went missing in Shadowbrook/Edgewood Drive area of Burlington, North Carolina March 28, 2019. Please notify me of found. He is take but very timid. Any information is very much appreciated.